In multiplayer games bots have been popular in giving an edge to players on certain tasks, like farming in-game currency in World of Warcraft, Eve Online, level up bots for Runescape. As a technical challenge it can be as basic as a program to play Tic Tac Toe for you, or as complex as DeepMind and Blizzard using StarCraft II as their AI research environment. If you are interested in getting your feet wet with Computer Vision, game automation can be an interesting and fairly easy way to practice: contents are predictable, well known, new data can be easily generated, interactions with the environment can be computer controlled, experiments can be cheaply and quickly tested. Grabbing new data can be as easy as taking a screenshot, while mouse and keyboard can be controlled with multiple languages. In this case we will use the most basic strategy in CV - template matching. Of course, depends on the problem domain, but the technique can be surprisingly powerful. All it does is it slides the template image across the input image and compares differences. See Template matching docs for more visual explanation of how it works. 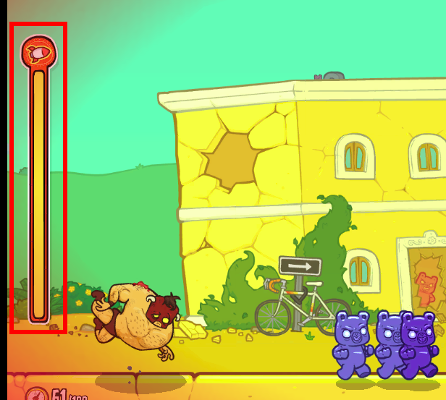 As the test bed I’ve chosen a flash game called Burrito Bison. If you’re not familiar with it - check it out. The goal of the game is to throw yourself as far as possible, squishing gummy bears along the way, earning gold, buying upgrades and doing it all over again. Gameplay itself is split into multiple differently themed sections, separated by giant doors, which the player has to gain enough momentum to break through. It is a fairly straightforward game with basic controls and a few menu items. 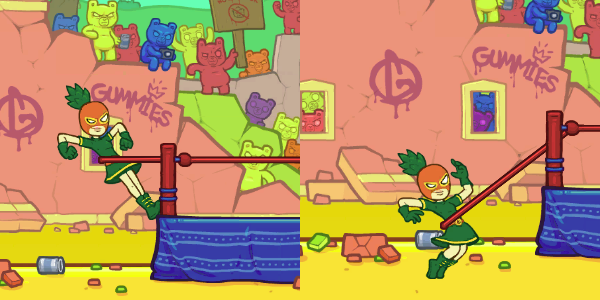 Drag the bison for it to jump off the ropes and start the game, left-click (anywhere) when possible to force smash gummy bears, buy upgrades to progress. No keyboard necessary, everything’s in 2D, happening on a single screen without the need for player to manually scroll. The somewhat annoying part is having to grind enough gold coins to buy the upgrades - it is tedious. Luckily it involves few actions and can be automated. Even if done suboptimally - quantity over quality, and the computer will take care of the tediousness. If you are interested in the code, you can find the full project on Github. Let’s first take a look at what needs to be automated. Some parts may be ignored if they don’t occur frequently, e.g. starting the game itself, some of the screens (e.g. item unlocked). But can be handled if desired. There are 3 stages of the game with multiple screens, multiple objects to click on. Thus the bot will sometimes need to look for certain indicators whether or not it’s looking at the right screen, or look for objects if it needs to interact with them. Because we are working with templates, any changes in dimensions, rotation or animations will make it more difficult to match the objects. Thus objects bot looks for have to be static. The round is started by pushing the mouse button down on the bison character, dragging the character to aim and releasing it. If bison hit the “opponent” - a speed boost is provided. Whether or not the current screen is the round starting screen. Because the player character will occur elsewhere in the game, the bot may be confused and misbehave if we use the bison itself. A decent option could be to use ring’s corner posts or the “vs” symbol. Once the round has started, the game plays mostly by itself, no need for bot interactions for the character to bounce around. To help gain more points though we can use the “Rocket” to smash more gummies. To determine when rocket boost is ready we can use the full rocket boost bar as a template. Left mouse click anywhere on screen will trigger it. 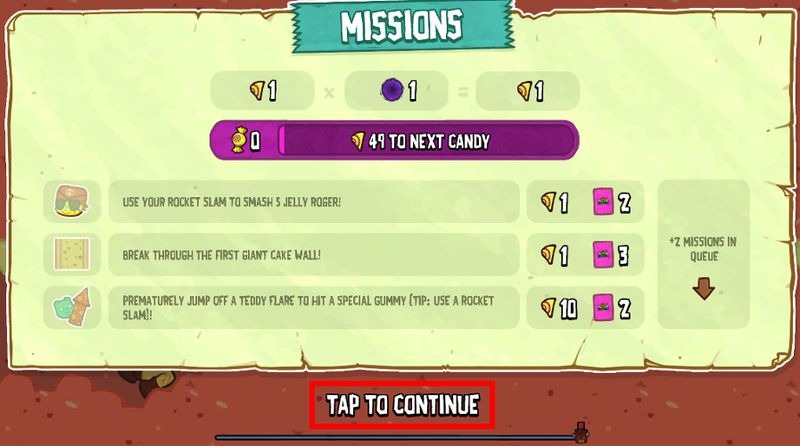 Once the round ends there are be a few menu screens to dismiss (pinata ad screen, missions screen, final results screen), and the bot will need to click a button to restart the round. 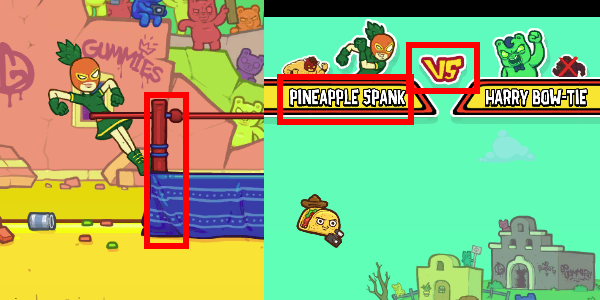 we can use “I’m filled with goodies” text as the template to determine if we’re on the pinata screen. Pinata animation itself moves, glows, which may make it difficult for bot to match to template, thus unsuitable. Simply match the “Tap to continue” to determine if we’re on this particular screen and left mouse click on it to continue. 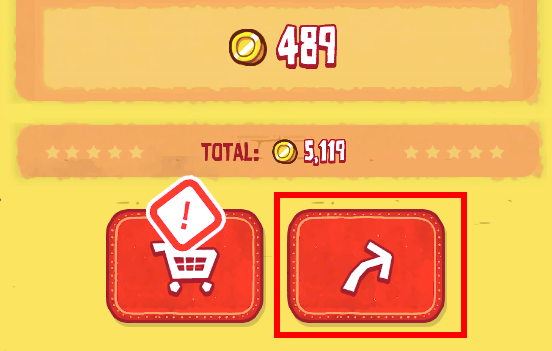 Here “Next” button is static and we can reliably expect it to be here based on game’s flow. The bot can match and click it. For vision we can use OpenCV, which has Python support and is the defacto library for computer vision. There’s plenty to choose from for controlling the mouse, but I found luck with Pynput. The number of steps used here is likely too high, considering the game should be capped at 60fps (or 16.6ms per frame). 40 steps in 200ms means a mouse position change every 5ms, perhaps redundant, but seems to work okay in this case. Sleeps in between mouse events help the game keep up with the changes. Depending on the framerate these sleep periods may be too long, but compared to humans they’re okay. I found the vision part to be the most finicky and time consuming. It helps to save problematic screenshots and write tests against them to ensure objects get detected as expected. During bot’s runtime we’ll use MSS library to take screenshots and perform object detection on them with OpenCV. First we start with the class. I cut out all of the template images for objects the bot will need to identify and stored them as png images. Images are read with cv2.imread(path, 0) method, where the zero argument will read those images as grayscale, which simplifies the search for OpenCV. As a matter of fact, the bot will only work with grayscale images. And since these template images will be used frequently, we can cache them on initialization. Configuration for MSS is hardcoded here, but can be changed or extracted into a constructor argument if we want to. RGB to BGR color conversion is necessary, as while the MSS library will take screenshots using RGB colors, OpenCV uses BGR colors. Skipping the conversion will usually result in incorrect colors. And refresh_frame() will be used by our game class to instruct when to fetch a new screenshot. This is to avoid taking and processing screenshots with every template matching call, as it is an expensive operation after all. To match templates within screenshots we can use the built-in cv2.matchTemplate(image, template, method) method. It may return more matches that may not fully match, but those can be filtered out. And while the reason is not obvious yet, let’s add a different variation of this method which would try to match at least one of rescaled template images. As we’ll later see, at the start of the round camera’s perspective may change depending on size of the opponent, making some objects slightly smaller or larger than our template. Such bruteforce method of checking templates at different scales is expensive, but in this use case it seemed to work acceptably while allowing to continue using the simple technique of template matching. Nothing fancy, the heavy lifting is done by OpenCV and Vision class. For object clicking offsets, they usually will be necessary as (x, y) coordinates will be for the top left corner of the matched template, which may not always be in the zone of object activation in-game. Of course, one could center the mouse on template’s center, but object-specific offsets work okay as well. Launching the character is more involved, as it requires dragging the character sideways and releasing. In this case I’ve used the left corner post instead of the character itself because there are two characters in rotation (Bison and Pineapple). This is where the bruteforce attempt comes in to detect different scales of templates. Previously I used the same template detection using self.vision.find_template(), but that seemingly randomly failed. What I ended up noticing is that depending on the size of the opponent affects camera’s perspective, e.g. first green bear is small and static, while brown bunny jumps up significantly. So for bigger opponents camera zoomed out, making the character smaller than the template, while on smaller opponents the character became larger. So such broad range of scales is used in an attempt to cover all character and opponent combinations. And that’s all there’s to it. Basic actions and screens are handled and in the most common cases the bot should be able to handle itself fine. What may cause problems are the ad screens (e.g. Sales, promotions), unlocked items, card screens (completed missions), newly unlocked characters. But such screens are rare. You can find the full code for this bot on Github. All in all this was an interesting experiment. Not optimal, but good enough. Matching templates got us pretty far and the technique can still be used to automate remaining unhandled screens (e.g. unlocked items). However, matching templates works well only when perspective doesn’t change, and as we’ve seen from difficulties of launching the player - that is indeed an issue. Although OpenCV mentions Homography as one of more advanced ways to deal with perspective changes, for Burrito Bison a bruteforce approach was sufficient. Even if template matching is a basic technique, it can be pretty powerful in automating games. While you may not have much luck in writing the next Counter Strike bot, but as you’ve seen thus far interacting with simple 2D objects and interfaces can be done fairly easily.